A quaint blue house in the middle of a quiet street became the perfect blank canvas for the Dixon Projects team. 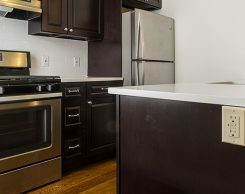 Due to its location in the up-and-coming neighbourhood of Jersey City Heights, this home received a full-gut renovation with an entire layout redesign and premium finishes. The Projects team opened up the common area to provide a generously sized layout more conducive to comfortable living. Large windows throughout let light pour in and shine off gleaming hardwood floors. 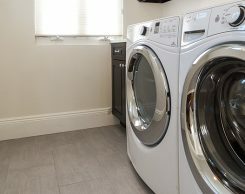 Unlike many one-bedroom homes, this unit offers separate dining and living areas, as well as a large laundry room with a full-size washer and dryer. 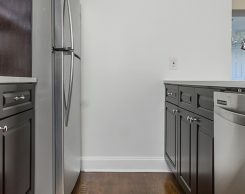 The kitchen presents dark cabinetry juxtaposed against pure white countertops and brand-new stainless steel appliances, including a gas range + hood, refrigerator and dishwasher. 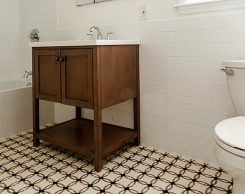 The bathroom received an attention-grabbing patterned tile floor paired with a unique wood vanity. 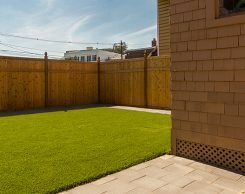 Outdoors, a private fenced yard features a cozy patio area and a large turf yard.